Choline: Super Brain Nutrient - Learn how to Feed a Brain! Nutrition and Traumatic Brain Injury: Improving Acute and Subacute Health Outcomes in Military Personnel. It is hypothesized that CDP-choline may exert neuroprotective effects in an injured brain through its ability to improve phosphatidylcholine synthesis (Adibhatla and Hatcher, 2002). In addition to its neuroprotective capability, CDP-choline potentiates neurorecovery, which has led to its evaluation as treatment for both stroke and TBI in animal models and in human clinical trials (Cohadon et al., 1982; Levin, 1991; Warach et al., 2000). The positive effects seen in models of ischemia and hypoxia may be explained by increased Bcl-2 expression, decreased apoptosis, and reduced expression of pro-caspase. Inhibiting caspase activity may decrease apoptotic activity and calcium-mediated cell death. Supporting these ideas, in vitro studies have also revealed that choline deficiency induces apoptosis in the liver by mechanisms independent of protein 53, which likely involve abnormal mitochondrial membrane phosphatidylcholine, leakage of oxygen radicals, and activation of caspases (Albright and Zeisel, 1997; Albright et al., 1996, 1998, 1999a, 199b, 2003; Chen et al., 2010). In humans, a choline-deficient diet also causes DNA damage and apoptosis (da Costa et al., 2006). CDP-choline is generally considered safe; the side effect most noted in clinical trials has been mild diarrhea, with leg edema, back pain with headache, tinnitus, insomnia, vision problems, and dizziness reported much less frequently (Adibhatla and Hatcher, 2002; Clark et al., 1997; Levin, 1991). There were no adverse events reported even with doses as high as 4,000 mg/day (Calatayud Maldonado et al., 1991). It is notable that in a study by Clark and colleagues (2001), a dose of 2,000 mg/day by enteral administration did not induce severe adverse events at a rate any higher than placebo in the 899 patients. Revisiting choline alphoscerate profile: a new, perspective, role in dementia? The role of citicoline in cognitive impairment: pharmacological characteristics, possible advantages, and doubts for an old drug with new perspectives. Gareri P, Castagna A, Cotroneo AM, Putignano S, De Sarro G, Bruni AC. Administered by both oral and intravenous routes, citicoline is converted into two major circulating metabolites, cytidine and choline. It is metabolized in the gut wall and liver. Pharmacokinetic studies suggested that it is well absorbed and highly bioavailable with oral dosing. A number of studies have clearly shown the possible role of citicoline in cognitive impairment of diverse etiology. It can also modulate the activity/expression of some protein kinases involved in neuronal death and increases SIRT1 expression in the central nervous system. The VITA study and the IDEALE study suggested that both parenteral and oral citicoline are effective and safe. Other studies have clearly demonstrated citicoline’s effects on several cognitive domains. Pivotal role of choline metabolites in remyelination. Skripuletz T, Manzel A, Gropengießer K, Schäfer N, Gudi V, Singh V, Salinas Tejedor L, Jörg S, Hammer A, Voss E, Vulinovic F, Degen D, Wolf R, Lee DH, Pul R, Moharregh-Khiabani D, Baumgärtner W, Gold R, Linker RA, Stangel M.
The objective of this study was to determine potential regenerative effects of the substance cytidine-5′-diphospho (CDP)-choline in two different murine animal models of multiple sclerosis. The effects of exogenously applied CDP-choline were tested in murine myelin oligodendrocyte glycoprotein-induced experimental autoimmune encephalomyelitis. In addition, the cuprizone-induced mouse model of de- and remyelination was used to specifically test the hypothesis that CDP-choline directly increases remyelination. We found that CDP-choline ameliorated the disease course of experimental autoimmune encephalomyelitis and exerted beneficial effects on myelin, oligodendrocytes and axons. After cuprizone-induced demyelination, CDP-choline effectively enhanced myelin regeneration and reversed motor coordination deficits. The increased remyelination arose from an increase in the numbers of proliferating oligodendrocyte precursor cells and oligodendrocytes. Further in vitro studies suggest that this process is regulated by protein kinase C. We thus identified a new mechanism to enhance central nervous system remyelination via the choline pathway. Due to its regenerative action combined with an excellent safety profile, CDP-choline could become a promising substance for patients with multiple sclerosis as an add-on therapy. Changes in brain striatum dopamine and acetylcholine receptors induced by chronic CDP-choline treatment of aging mice. 1. Spiroperidol binding (dopamine D2 receptors) and quinuclidinyl benzilate binding (muscarinic receptors) in striata of 19-month old mice was analyzed for animals that had received chronic administration of cytidine 5′-diphosphocholine (CDP-choline) incorporated into the chow consumed (100 or 500 mg kg-1 added per day) for the 7 months before they were killed. 2. Treated animals displayed an increase in the dopamine receptor densities of 11% for those receiving 100 mg kg-1 and 18% for those receiving 500 mg kg-1 as compared to the control aged animals that had received no CDP-choline. Control animals showed, from 2 months to 19 months of life, a 28% decrease in the receptor density. No change in the affinity of the receptors for spiroperidol was found in the treated or untreated animals. 3. Muscarinic acetylcholine receptor densities were also partially recovered by the same treatment in aged animals that showed a 14% decrease of these receptors in this case. The muscarinic receptor density increased 6% for the animals that received 100 mg kg-1 and 17% for the animals that received 500 mg kg-1 without any change in the affinity of the receptor for quinuclidinyl benzilate. 4. Aged animals displayed a slight increase in brain membrane fluidity as indicated by a decrease in the polarization value of the non-polar fluorophore 1,6-diphenyl-1,3,5-hexatriene. Interestingly, in the treated animals a greater increase in membrane fluidity was determined and found to be very similar for the two doses. Citicoline or cognizin is known in the scientific realm as CDP-choline (cytidine 5’ diphosphocholine). In the nutritional world, it is usually just called choline, but choline comes in many forms other than just CDP-choline. Our bodies produce choline in the form of CDP-choline so it is considered a conditionally essential nutrient. However, if we restrict choline in our diets then the first thing to occur is the onset of nonalcoholic fatty liver disease (NAFLD). NAFLD will eventually lead to cirrhosis (scarring of the liver), steatosis, and eventually liver cancer. In addition to having many benefits for our brains and neurotransmitters, choline also helps our liver direct where fat and cholesterol where to go and how to be utilized. Without it, all of the fat and cholesterol builds up in our liver. Choline is also an important component of the phospholipids that make up our neurons. Many people take sunflower lecithin or rice bran to get these phospholipids in the form of phosphatidylserine, and phosphatidylcholine. Choline is also an essential component of acetylcholine which is a neurotransmitter that is responsible for focus, learning, and memory. It is one of the most important neurotransmitters for learning, and it is up there with dopamine that drives motivation, and learning. It is possible to get Citicoline, phosphatiadylserine, phosphatidylcholine, betaine, choline bitartrate, and alpha- GPC (glycerophosphocholine). Citicoline (CDP-choline) is my favorite. Interestingly enough, when we take the specific form of choline called CDP-choline, we see that not only do new neurons begin to grow, but also that these new neurons have more acetylcholine and dopamine receptors. Most of the time when we see more receptors, as in the case of stimulants like amphetamines, it takes more of a neurotransmitter like dopamine to create the same effect. However, with CDP-choline supplementation, we see the exact opposite. We see an increased sensitivity to these neurotransmitters which improves our ability to learn and solve problems significantly. What Happens to the Supplemental Choline in My Brain? Approximately 18% of the CDP-choline is converted into acetylcholine following ingestion, and the rest is stored in our neurons as phosphatidylcholine for later use. It is, in my opinion, one of the best all-around brain supplements. The nucleoside uridine is also produced in the conversion process of CDP-choline in the brain. This nucleoside is involved in the creation of the mRNA (messenger ribonucleic acid) that tells our brain to make more neurons. In fact, uridine is often the rate limiting factor for these neurogenesis, and synaptogenesis reactions. This is why as a stand-alone brain supplement, CDP-choline is definitely one of the best because it converts into so many other beneficial nutrients. That being said, CDP-Choline is even more effective for synaptogenesis when combined with DHA (docosahexaenoic acid), and uridine monophosphate. Learn more about DHA’s Effect on the Brain here. What Kind of Choline is Right for Me to Take? 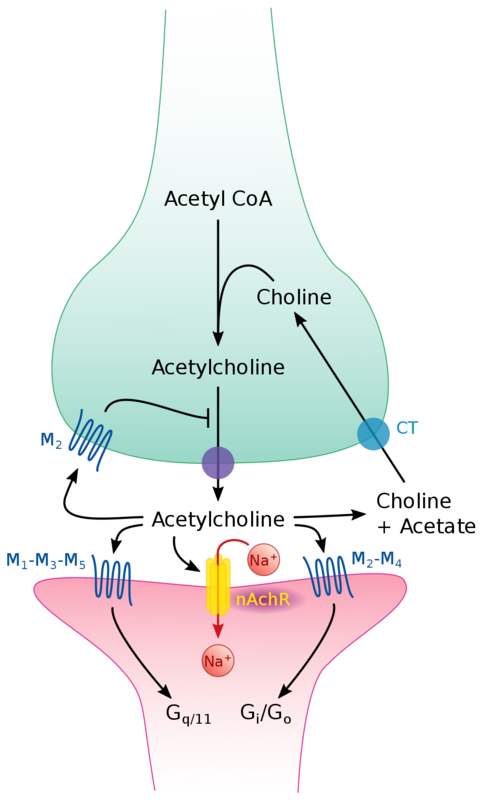 Here we see choline becoming acetylcholine which is a neurotransmitter that helps with focus memory and learning. We discussed before that our bodies produce choline so there is no recommended daily intake or RDI, however, we will become ill if we do not consume a certain amount. The Linus Pauling Institute recommends between 400-500mg per day for most adults. There are other supplemental forms of choline like choline bitartrate and Alpha-GPC. Choline bitartrate is the cheapest form of choline. It is also the least bioavailable, and thusly less of it converts into acetylcholine. Alpha-GPC ( aka alpha-glycerophophorylcholine) is typically favored in the nootropic world because it has the highest conversion into acetylcholine. This makes it great for those who take nootropics like the Racetams. It also upregulates human growth hormone (HGH) which makes it a great supplemental addition for athletes. However, it can also increase risk factors for prostate cancer since it alters hormone function. CDP-choline is our favorite as a standalone supplement and a general brain health supplement. CDP-choline has been shown to increase neurogenesis even on its own, but when combined with DHA and uridine, this becomes a nutritional powerhouse for the brain. CDP-choline (or Citicoline) not only produces uridine in the brain as it converts to acetylcholine, but it also increases the number of cell receptors for dopamine and acetylcholine which both help with learning, and motivation.